Old Boy (オールド・ボーイ, Ōrudo Bōi) is a Japanese manga series written by Garon Tsuchiya and illustrated by Nobuaki Minegishi. The narrative follows the protagonist Shinichi Gotō, a man who, after a decade of incarceration in a private prison, is suddenly freed. After his release, Gotō must find his captors and discover the reason for his confinement. Old Boy was serialized in the Futabasha magazine Weekly Manga Action from 1996 to 1998, with a total of 79 chapters among eight collected volumes released during that time. The series was picked up for North American localization by Dark Horse Comics and released between 2006 and 2007. The manga was also adapted into an award-winning South Korean film, directed by Park Chan-wook in 2003. In 2013, Spike Lee directed an American remake of the 2003 Park Chan-wook film. Twenty-five-year-old Shinichi Gotō was kidnapped one fateful night and locked up in a private jail for unknown reasons. After ten years of solitary confinement in a maximum security cell, with only a television for company, he is suddenly released. The story follows his mission to hunt down the identities of his captors and uncover the reason behind his imprisonment. The main character of the story who was kidnapped and locked up for 10 years. The main villain of the story, who was once an elementary school classmate of Gotō and is now seeking revenge for Gotō inadvertently shattering his sense of self-worth. A writer and former teacher. She was Gotō and Kakinuma's 6th grade teacher. A lady who became Goto's girlfriend. She is actually a paid actress under hypnosis placed upon her by Kakinuma. Old Boy was serialized in the Futabasha magazine Weekly Manga Action from 1996 to 1998. A total of 79 chapters among eight tankōbon (collected volumes) were released in Japan from May 28, 1997 to October 28, 1998. Between June 19 and July 17, 2007, Futabasha re-released the entire series in five, larger volumes. In 2005, Dark Horse Comics bought the rights to make an English translation of the book for its customers worldwide. All eight volumes were released from July 5, 2006 to October 10, 2007. In 2003, it was adapted into the award-winning Korean film Oldboy by South Korean director Park Chan-wook. The film was a huge international success and went on to win various awards including the Grand Prix of the Jury at the 57th Cannes Film Festival awards ceremony. In 2006, an Indian version titled Zinda and directed by Sanjay Gupta received flak for its unofficial, unauthorized remake. A subsequent American film adaptation was directed by Spike Lee in 2013. 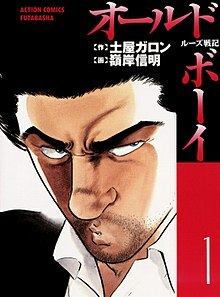 In 2007, the Old Boy manga won an Eisner Award in the category of "Best U.S. Edition of International Material - Japan." Eduardo Chavez of Mania.com noted that "titles like Old Boy... take their time to create a wonderful of paranoia and drama". Anime News Network's Carlo Santos praised the artwork, which "fits the tone of the series well" and the pacing of the story, but mentioned poorly developed characters. ^ "Old Boy Vol. 1 TPB". Dark Horse Comics. Retrieved June 26, 2018. ^ "Steven Spielberg, Will Smith Discuss Remake of Oldboy (Updated)". Anime News Network. November 7, 2008. Retrieved August 29, 2018. ^ "Jason Thompson's House of 1000 Manga - Old Boy". Anime News Network. Retrieved June 27, 2018. ^ a b "株式会社双葉社 オールドボーイ 1(オールドボーイ)" (in Japanese). Futabasha. ISBN 4-575-82240-X. Retrieved May 15, 2011. ^ a b "株式会社双葉社 オールドボーイ 8(オールドボーイ)" (in Japanese). Futabasha. ISBN 4575823783. Retrieved May 15, 2011. ^ "株式会社双葉社 書誌インデックス". Futabasha. Retrieved May 15, 2011. ^ "News: Dark Horse Takes on Horror". Anime News Network. October 8, 2005. Retrieved May 15, 2011. ^ a b "Old Boy Vol. 1 TPB". Dark Horse Comics. Retrieved May 15, 2011. ^ a b "Old Boy Vol. 8 TPB". Dark Horse Comics. Retrieved May 15, 2011. ^ "株式会社双葉社 オールドボーイ 2(オールドボーイ)" (in Japanese). Futabasha. ISBN 4575822744. Retrieved May 15, 2011. ^ "Old Boy Vol. 2 TPB". Dark Horse Comics. Retrieved May 15, 2011. ^ "株式会社双葉社 オールドボーイ 3(オールドボーイ)" (in Japanese). Futabasha. ISBN 4575823201. Retrieved May 15, 2011. ^ "Old Boy Vol. 3 TPB". Dark Horse Comics. Retrieved May 15, 2011. ^ "株式会社双葉社 オールドボーイ 4(オールドボーイ)" (in Japanese). Futabasha. ISBN 4575823325. Retrieved May 15, 2011. ^ "Old Boy Vol. 4 TPB". Dark Horse Comics. Retrieved May 15, 2011. ^ "株式会社双葉社 オールドボーイ 5(オールドボーイ)" (in Japanese). Futabasha. ISBN 4575823538. Retrieved May 15, 2011. ^ "Old Boy Vol. 5 TPB". Dark Horse Comics. Retrieved May 15, 2011. ^ "株式会社双葉社 オールドボーイ 6(オールドボーイ)" (in Japanese). Futabasha. ISBN 4575823627. Retrieved May 15, 2011. ^ "Old Boy Vol. 6 TPB". Dark Horse Comics. Retrieved May 15, 2011. ^ "株式会社双葉社 オールドボーイ 7(オールドボーイ)" (in Japanese). Futabasha. ISBN 4575823694. Retrieved May 15, 2011. ^ "Old Boy Vol. 7 TPB". Dark Horse Comics. Retrieved May 15, 2011. ^ "News: No Award for Innocence at Cannes". Anime News Network. May 23, 2004. Retrieved May 15, 2011. ^ "올드보이 (Oldboy) Makers Plan Vengeance on 'Zinda'". TwitchFilm. November 16, 2005. Archived from the original on February 4, 2016. Retrieved October 30, 2015. ^ "Spike Lee Confirmed to Direct 'Oldboy'". /Film. July 11, 2011. ^ "Old Boy Wins Eisner Award". Anime News Network. July 29, 2007. Retrieved May 15, 2011. ^ Chavez, Eduardo M. (June 27, 2007). "Old Boy Vol. #03". Mania.com. Demand Media. Archived from the original on October 7, 2012. Retrieved January 31, 2010. ^ Santos, Carlo (November 12, 2006). "Old Boy GN 2 - Review". Anime News Network. Retrieved January 31, 2010. This page was last edited on 1 April 2019, at 03:59 (UTC).